New tools give educators more control over their classroom roster and powerful integration with SIS. Google developers made a splash early on Monday at ISTE 2015 with two big announcements for Classroom, its popular assignments management tool for teachers. 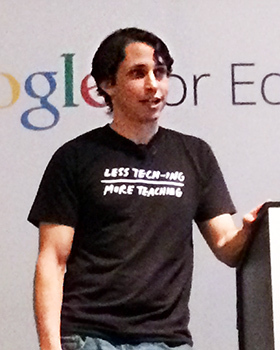 Google Classroom Product Manager Zach Yeskel unveiled two big announcements for the popular app Monday at ISTE 2015. During a Google developer breakfast Monday, Google Classroom's Product Manager Zach Yeskel took the stage, wearing a T-shirt emblazoned with “Less Tech-ing, More Teaching." That phrase embodies the design philosophy the company has taken for many of its education products, especially Google Classroom. Yeskel unveiled two new ways for teachers to integrate content with Classroom: a share button that helps teachers share links and videos to entire classrooms, and a new application programming interface (API) that makes it far easier to integrate a Classroom roster with other student information systems (SIS). "Classroom is really designed to save teachers time," says Yeskel. "So Classroom needs to work seamlessly across different systems." The API function was shown off by Riley Eynon-Lynch, CEO of Pear Deck, a presentation software built using Google Drive. The API tool lets developers interact with Classroom's roster function, enhancing control over who is in each class and allowing educators and administrators to export a roster for integration with other SIS. The API tool also bypasses time-consuming code entries. Gone are the days of students entering six-character codes to enable them to enter a new class or participate in a slide deck. Teachers can send custom invites to groups of students. "This is something that's usually 60 seconds of frustration right at the beginning of class that are now zero seconds," says Eynon-Lynch. Educators interested in the API can apply for early access to the preview, says Yeskel, but the full rollout is planned for just after July. During the Monday session, Google representatives also underscored the success of Chromebooks, saying more than 10 million students now actively use the low-cost notebook. Catch all of EdTech’s ISTE 2015 coverage, including articles and video interviews, by visiting our conference landing page.